Anyone interested in discussing what is the actual evidence for the allegations regarding Chelmno/Kulmhof and the mass murder there in 'gas wagons'? Chelmno or Kulmhof is considered to be the first place where mass gassings of people were carried out against people categorised as Jewish. Mass-gassings are alleged to have started there on the 7th or 8th of December of 1941. The holocaust narrative states that an estimated 152,000 to 360,000 men, women and children were killed at Chełmno. That is, the estimates vary with room for a 208,000 disparity margin. In a small Polish village, the "final solution of the Jewish question" commenced with the establishment in December 1941 of the first camp built for the sole purpose of extermination, at Chełmno nad Nerem (Kulmhof an der Nehr [Ger], Chełmno on the Ner River [Eng]). Whole communities of victims were gassed here day after day. Located 60 km (37 miles) northwest of Łódź, and connected by a railway annex to the town of Koło 14 km away (8.5 miles), it was not difficult to transport people without attracting much outside attention. Chełmno was organised on a small estate or manor, surrounded by about 5 acres of land. Transports of about 1,000 people a day in 20-22 wagons were brought here under the pretence that they would be "resettled." To gain the cooperation of the deportees, the Nazis encouraged them to exchange their Polish money into German marks and sell their belongings or leave them for "safekeeping" at carpenters' shops in the ghetto. Each received warm clothing, bread and sausage for the journey. Chelmno appears to be another alleged extermination centre that has no conclusive empirical or documentary evidence supporting the allegation that it was a place of mass extermination. The evidence provided to support the allegation is predominantly 'witness' testimony. And in this case the 'survivor witness' testimony is quite limited. This fact alone can be interpreted to confirm the view that everyone else who was deported to Chelmno did not survive the war and therefore were murdered there. Though another explanation is that very few people actually were deported to Chelmno, and of those who had passed through, none wanted to contradict the official story in the 1960's when it became more widespread, and expose themselves to receiving the ostracisation, violence and threats that fellow-Jews like Joseph Burg (Ginsburg) received for contradicting the emerging holocaust narrative. There were a few people who later testified as 'survivor' witnessess to what occurred at Chelmno. Mordechai Zurawski and Michał Podchlebnik were two of them. Another one was Shimon Srebnik, who died in Israel in August 2006 aged 76. ...a total of seven Jews from the burial Sonderkommando escaped from the Waldlager. Determining the identities of the few survivors of Chełmno had presented ambiguity because records use different versions of their names. One survivor may not have been recorded in the early postwar years because he did not testify at trials of camp personnel. Srebnik said he was deported in 1944 aged 13 with his mother to Chelmno from the nearby Lodz Ghetto. He testified about Chełmno for a trial held in Łódź, Poland in 1945. He and the two others who had been at Chełmno testified at the 1961 Adolf Eichmann Trial in Jerusalem (session 66-68) previously discussed here by Werd. He testified in the Chełmno Guard Trials, which were conducted in Germany from 1962–1965. He also appears in the beginning of the film released in 1985 by Claude Lanzmann called Shoah where he says its impossible to describe what happened at Chelmno, that noone can understand it, not even himself. He describes there flames from the crematorium 'ovens' reaching “up to the sky”. Yet in a later interview he talks not of ovens but of an open furnace over grids with bodies piled in between layers on wood. Q1: Was it ovens or a furnace built upon railway grids? When we got to Chelmno the older people said, 'What a beautiful place, we'll be happy here, it's green, birds are singing. A real health resort.' I remained in the 'house kommando.' I was in a barrack with Waler Bonmeister. We sorted people's gold and possessions, things people left behind, suitcases. There was a big tent where Jews sorted things. How did I know my mother arrived in Chelmno? 'Yes, she's in heaven,' he said. 'It's my mother's.' I was naive. I didn't know what he meant by 'heaven'. There were three gas vans. The exhaust gas from the engine entered the van through a gridiron on the floor. Each van held 80 people. There was a bigger van that held 100 people. The distance from Chelmno to the forest was four kilometers. During the ride, gas entered the van. When the doors opened, you could see that all the dead were injured. Everyone wanted to survive, wanted to live, so they scratched each other. It was terrible. When the van reached the furnace, two people entered. The furnace was already lit. What a fire! There was a railway gridiron in the furnace. They put a layer of wood on top of it and lit it and then a layer of people, and a layer of wood. This happened every two days. They pulled out gold teeth along with the flesh. I sat and removed the gold from the flesh. It smelled awful. I collected the victim's teeth. It wasn't only my mother, I handled thousands of mothers. My heart ached for them and for my mother. But there were thousands like her... Did I think about my mother? She was already in heaven. Nothing could be done." He said: “When the van reached the furnace, two people entered. The furnace was already lit. Q2: would it be possible to pile corpses on such a furnace AFTER it was alight? He describes there vans that could hold 80 to a 100 people. In testimony he gave to a court judge in June 1945 (while not under oath) he stated that of the three alleged gas vans at Chelmno one could hold as many as 170 people. 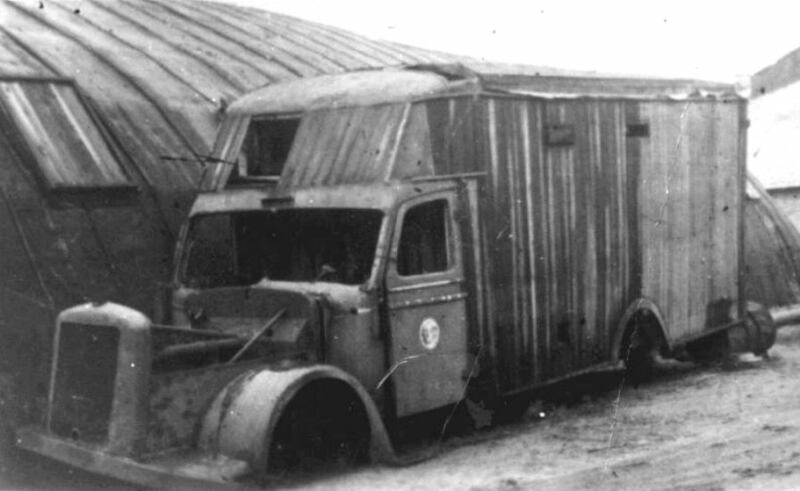 In Chelmno there were two death vans. At the time of my stay in Chelmno generally only one of them was used. The other one, the smaller one, with the carrying capacity of 80 persons, was kept in Chelmno in reserve. Both vehicles were sent to Berlin, to which city they were driven by Laabs and Runge. The men were not (in Chelmno) for over a week. Apart from this there was one more van, used for disinfecting clothes. Q3: could this van hold 80 to a 100 or 170 people? Srebnik also implied in his 1945 testimony that people gassed in the vans became unconscious after only four minutes. He says nothing about vividly pink corpses. In the evening fellow prisoners from the Waldkommando told us what had happened in the woods. 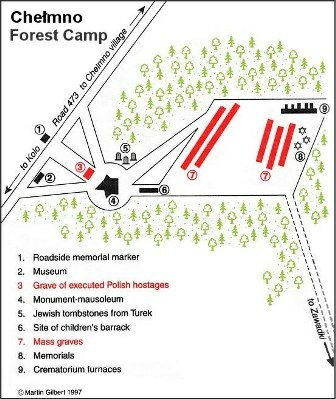 After the trucks arrived, the Jews were ordered to go to one of the barracks in the woods. The Jews were driven out of the barracks and loaded into a van of a special type. There were three vans: larger one and two smaller ones. The larger van could hold up to 170 people, while the smaller ones, 100-120. The van doors were locked with a bolt and a padlock. Then the engine was started. The exhaust fumes entered the interior of the van and suffocated those inside. The exhaust pipe went from the engine along the chassis and into the van, through a hole in the car’s floor, which was covered with a perforated sheet of metal. The hole was located more or less in the middle of the chassis. The van’s floor was also covered with a wooden grate, just like the one in the bathhouse. This was to prevent the prisoners from clogging the exhaust pipe. I do not know the make of the engine. The chauffeurs were Burstinger, Laabs and Gielov. Shouting and banging on the door lasted about four minutes. The van was not moving at that time. After the shouting faded, the vehicle started moving in the direction of the crematoriums. When the van reached its destination, it’s door was unlocked to let the fumes out. Then two Jews went inside and threw out the bodies. The gas coming out had all the characteristics of the exhaust fumes (colour and smell) I cannot be mistaken here. The corpses, having been searched through, were placed in the furnace. ...The camp was liquidated and the barracks dismantled. Machines for shredding clothes and underwear were sent back. The furnaces were also dismantled. In the granary there were still 87 Jewish workers. Those were tailors and shoemakers. They lived upstairs. The number of workers decreased and finally there were 47 of them left – 22 tailors and 25 courtyard workers. When the Soviet army was advancing quickly, one night we were ordered to leave the granary in groups of five. I cannot remember the date. The area was lit with car headlights. I went outside in the first group of five. Lenz ordered us to lie down on the ground. He shot everybody in the back of the head. I lost consciousness and regained it when there was no one around. All the SS men were shooting inside the granary. I crawled to the car lighting the spot and broke both headlights. Under the cover of darkness I managed to run away. The wound was not deadly. The bullet went through the neck and mouth and pierced the nose and then went out. Q4: wouldn't his nose show signs of a such a bullet wound as he described receiving, shot from such close proximity? “The number of people killed at Chelmno could not be calculated from reliable data or railway records as the camp authorities destroyed all the evidence. Its not as reliable as it used to be but it might explain it, I personally do not know much about the furnaces at chelmno I only know how the gassings worked. "They were built deep in the ground and did not project above its surface. They were shaped like inverted cones with rectangular bases. At the top at ground level the furnaces measured 6x10 m (2Ox33 ft.) and they were 4 m (13 ft.) deep. At the bottom, by the ash-pit, they measured 1.5x2 m (5x6 ft.). The grates were made of rails. A channel to the ash-pit ensured the admittance of air and permitted the removal of ashes and bones. The sides of the furnace were made of firebrick and faced with cement. In the furnace were alternate layers of chopped wood and corpses: to facilitate combustion, space was left between the corpses. The furnace could hold 100 corpses at a time, but as they burned down, fresh ones were added from above. 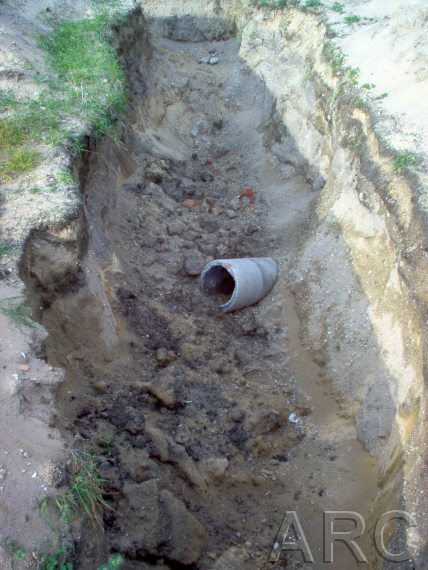 The ashes and remains of bones were removed from the ash-pit, ground in mortars, and, at first, thrown into especially dug ditches; but later, from 1943 onwards, bones and ashes were secretly carted to Zawadka at night, and there thrown into the river." To be honest though... this guy sounds like hes describing something close to the Dresden cremation grills. Then again though this is only my personal speculation based on this one line. Thought i might as well give something "Orthodox" here... its a pretty dead thread. "I made a mistake when I said there were no gas chambers at Auschwitz... History is a constantly growing tree - the more you know, the more documents become available, the more you learn, and I have learned a lot since 1989...Yes, there were gas chambers, Millions of Jews died, there is no question. I don't know the figures. I'm not an expert on the Holocaust." D-H wrote: To be honest though... this guy sounds like hes describing something close to the Dresden cremation grills. Except that putting them "deep in the ground" would severely restrict the oxygen available with the obvious consequences. What exactly are you implying roller? Cause by you saying this you could be implying 2 things. No, it is impossible for human bodies to be totally consumed by flames in this manner, as not enough heat can be generated in open pits. No. It is impossible for human bodies to be totally consumed by flames in this manner because of lack of oxygen. 2) that the cremation would be very slow and not productive. So which exactly is it? If your argument is number 1, then I think you should learn a bit more about Greek history. And if your claiming 2... I think that its said very well in the testimony given by our survivor. As they did mention this below. A channel to the ash-pit ensured the admittance of air and permitted the removal of ashes and bones. And the Channel is shown here. So how is Oxygen a problem? In the first post starting this conversation I pointed out how it is admitted in the currently consensus 'holocaust' narrative, that most of the 'evidence' for what is alleged to have occurred at Chelmno/Kulmhof relies almost entirely on 'witness' testimony. Uniquely, there are only three or four people who were accepted as being 'survivor witnesses'. Close examination of their testimony and analysis of the reliability of their claims seemed a good place to start. I therefore detailed some of the testimony from the longest living of these. And I asked four questions. FLAMES from the crematorium 'ovens' reaching “up to the sky”. He described vans that could hold 80 to a 100 people. Srebnic wrote: The Jews were driven out of the barracks and loaded into a van of a special type. There were three vans: a larger one and two smaller ones. The larger van could hold up to 170 people, while the smaller ones, 100-120. In Chelmno there were two death vans. At the time of my stay in Chelmno generally only one of them was used. The other one, the smaller one, with the carrying capacity of 80 persons, was kept in Chelmno in reserve. ...Apart from this there was one more van, used for disinfecting clothes. Srebnic wrote: The larger van could hold up to 170 people, while the smaller ones, 100-120. The vehicles were specially adapted vans. ...Shouting and banging on the door lasted about four minutes. The van was not moving at that time. When the Soviet army was advancing quickly, one night we were ordered to leave the granary in groups of five. I cannot remember the date. The area was lit with car headlights. I went outside in the first group of five. Lenz ordered us to lie down on the ground. He shot everybody in the back of the head. I lost consciousness and regained it when there was no one around. I understand that the majority of replies have been dealing with Q.2. 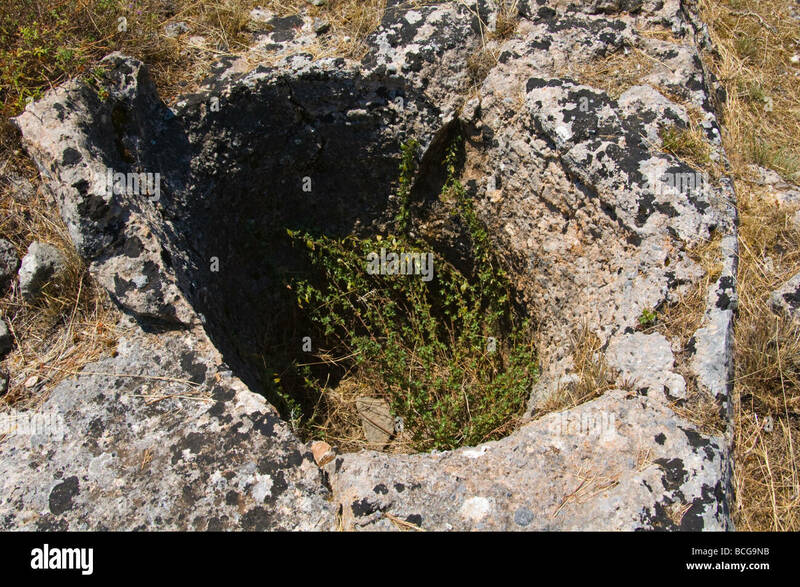 If we accept that the grid furnace in a pit was possible, DID that pit-furnace enable corpses to be added to it once it was alight, as described? And, if we can avoid getting bogged down in detail, can we address the other questions also and the bigger picture? Obviously the method of cremating bodies is of lesser importance to the currently enforced narrative of systematic genocidal mass-murder than the credibility of the alleged mass-murder weapon. Basically the question before any honest investigator is how much this man was relating just his own experiences, or whether he was also inventing testimony and adding detail learned after the war to fit the emerging post-war 'atrocity' narrative that has morphed into what became known in the seventies as 'THE Holocaust'? E.g. in what I understand to be earlier testimony he talks of cremation ovens, then later talks of furnace pits. What is also very tellingly missing from his testimony (and all the others) of course is any mention of the quite distinctive and remarkable bright pink colouration of corpses which would be expected from any credible and genuine witness to a long period of mass-murder by carbon monoxide asphyxiation. Obviously if it can be proved he was exaggerating and even lying about parts of his testimony, that would not negate the allegation of mass-murder at this site. It would only prove one witness was not entirely credible in his relating of an actual occurence. The questions then would be 1.) how much of the Chelmno/Kulmhof narrative can be aligned within the realms of physical possibility, and 2.) what empirical evidence exists to support the allegations, ESPECIALLY in terms of 3.) the allegations of the numbers of victims. I.e. its an obvious physical impossibility to murder 180,000 to 340,000 people in the time alleged in such vans as is claimed. Could 70, 80, 100-120, 130 or 170 people have fitted inside? That is affirmed by both the survivor and perpetrator witness testimony. When many witnesses — both accused and accuser — agree on testimony that VERY CLEARLY defies physical possibility, then we can know that other forces had been at work, to result in such impossible yet agreed testimony. been-there wrote: I understand that the majority of replies have been dealing with Q.2. 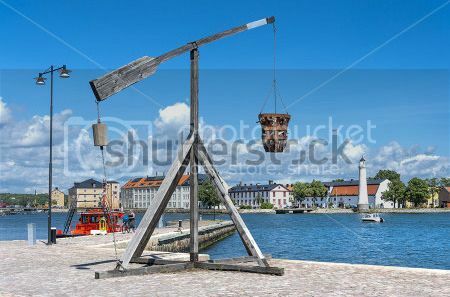 Adding corpses to the centre of a cremation pit once it was alight would have been a very simple engineering task achieved by using a primitive wooden crane similar to the one pictured below. However, I do not recall ever hearing eyewitnesses claim such apparatus were used at Chelmno (or anywhere else cremation pits were alleged to have been used). been-there wrote: Q1: Was it ovens or a furnace built upon railway grids? It is no longer possible to be certain why Srebrnick said what he did and use different words at different times. The issues are how important is it that he said oven on one occasion and a furnace on another and does his change in descriptive discredit his evidence? To make an educated decision would mean a study of witnesses to see generally how consistent people are when describing the same thing but at different times, places and under different circumstances. Otherwise an oven and a furnace are not radically different. Both are fires in enclosed spaces, which is what the cremation pits described at Chelmno were. been-there wrote: Q2: would it be possible to pile corpses on such a furnace AFTER it was alight? "Any fire in a hole is more comfortable to work at in hot weather, for the heat does not radiate as readily from the sides. It is the safest fire to use when the wind is blowing hard, or when the ground is covered with dry grass or leaves." So it would be possible to pile more corpses on from the sides of the pit. been-there wrote: Q3: could this van hold 80 to a 100 or 170 people? From the photo linked to the lower estimates look more realistic. To get 170 people into the van does not appear possible. been-there wrote: Q4: wouldn't his nose show signs of a such a bullet wound as he described receiving, shot from such close proximity? "A. Yes. My nose was cut open in two places. I asked the doctors how this happened, and they told me that when the shot hit me, I must instinctively have raised my head, and afterwards it dropped downwards, and apparently there was some piece of glass there, and I received these cuts." So there is a reason why nothing of note is visible on his nose now instead of a gaping exit wound. The maximum crowd density is ~8 people per square meter so 170 people would require 21.25 square meters of floor space. Standard truck width is 96 inches or 2.46 meters for that time. The necessary length of the van can be calculated by dividing 21.25 by 2.46 or 8.64 meters. That's 28 feet. The van in the photo doesn't have a 28 feet long box.